When you mention the phrase “the principal’s office”, what comes to your mind? Paddlings? Suspensions? Other punishments? Bad news phone calls? Detention? Missed recesses? I could continue with the list of negative actions associated with the title of principal. We are notoriously known for being “the bad guys” of school. Many of the assumptions made by others are due to the way things used to be regarding classroom management and punishments attached to specific behaviors. Sadly, there are places where this type of school leader still exists. I challenge all LEAD LEARNERS (this “title” is the first process in breaking the mold) to join me. I also invite anyone in education, and anyone who supports education (this should be everyone!) to join me in an effort to break the mold of what used to be, and redefine what needs to be! Let’s create a new stereotype for the principal/lead learner role. It starts with considering perceptions and assumptions of others. You look way too nice to be a principal. I bet none of the kids are afraid of you! Aren’t you a little young to be “in charge” of a school? You’re way too happy and smile way too much to be a principal. I bet when you have to paddle kids it doesn’t even hurt! So why in the world do you stand outside and monitor the car line instead of getting a staff member to do it? I threatened my son with you last night! He better not have to come see you! You’re the boss, you have people to do __________ for you. What punishment does she get for having to come see you? Aren’t you a little too “out there” to be a principal? Everyone sees your social media profiles. Are you not afraid to be judged for self promoting? I assumed the principal was a man. Education administration is primarily a man’s world, which most likely enhances some of the perceptions and assumptions, but much of what people have experienced in the past as a student has caused them to have fixed opinions about the principal’s role in a school. Most times I am able to laugh these comments off…let them roll off of my back, so to speak. There are times when I am offended by them, depending on the tone, nature of comment, or who is speaking it. It becomes hurtful when people decide my ability based on assumptions before ever given a chance to show them who I am. Everyone faces judgement by others, and it hurts to the core at times. We can allow this to define us. We can also allow it to wear us down. We can sometimes even give in completely and become ineffective within our role. I refuse to do that. I am on a mission to inform others on what being a lead learner in a school is truly all about. I WILL break through the perceptions and stereotypes to recreate the mold. We are so much more than punishers and bosses. It is time to transition from “The Principal” to “The Lead Learner”. I suggest starting with 3 responsibilities to become focused on breaking the mold. We cannot create a new perspective without stamping out the old. Everyone needs encouragement, whether they want to admit it or not. Kids need it continually, and will ask for it in many ways. Some will ask you to validate them, and others will seek attention even if it means they have to act out in order to be noticed. We have no idea what some of our kids are leaving behind them when they enter the building, so they need encouragement and validation on a regular basis. Teachers and staff need an encourager. They have one of the most challenging jobs because everything they say and do impacts the kids around them either positively or negatively. What a challenging position to be in for five days a week! School staff need to be reminded they make a difference academically and socially. The little things that are done for children…sticking an extra snack in a child’s backpack, hugs, personal notes, positive phone calls home…they are encouragers to their kids and families. I must be an encourager for them. One of the biggest reasons for assumptions of principals is that most do not know who they really are! We are viewed as “secret people” who do not come out of the office much, don’t go out in public to eat or shop, have people do most things for them within the school, and considered unapproachable. I don’t want to be viewed as unapproachable. I want people to know I am authentic, and someone to count on for support and encouragement (see above!). Some of my favorite times of the day are the conversations with kids, families, and staff that are impromptu, unscheduled, and even random! Those are the moments that we can often make the largest impact. Appearance is a first impression, and we are often judged by this alone. Some people make up their mind about others simply based on one’s stature, gender, hair color, etc. It can be hurtful when we are shunned or underestimated because of how we look! Everyone experiences it at some point, as I have and do. Phrases such as, “The Barbie Principal”, “Blondie”, and “High Maintenance” have been often used in reference to me in the past. I have been judged on my intelligence and ability simply because I have blonde hair. How do we move through the obstacles of these stereotypes? The answer is simple…by showing our REAL! Wear jeans and tshirts (and not just on Fridays)! Play with kids outside and even get dirty! Grab the mop in the cafe when there is a spill. Talk to kids and families in stores and restaurants. Attend kids’ events and activities when possible. Actions speak loudly…what do they need to say to others in order to recreate the mold? Lead learners demonstrate transparency of not having all the answers, making mistakes, and asking for forgiveness. I mess up daily. I fail daily. I also do things right and achieve success daily. This is life. Great leaders are successful, but imperfect. The power is in ownership of imperfections and allowing others to support them. That is REAL. Passion is a must in order to live life fully, and to achieve happiness. Without passion, life does not have much meaning. The passion we have within us is directly connected to our WHY, and how we live it to inspire others. It is meant to be shared, not withheld. You will be ridiculed by some for being “over the top” or “a little too excited”, and that is perfectly fine. Few people will see your passion that way, and most will see it as a fuel for their own passion. The ability to share passion is a gift like no other, and keeps on giving to everyone who is exposed. Families want passionate educators for their children and they deserve nothing less! If an educator lacks passion or is unwilling to share their love for what they do, then it is time to leave the profession. Kids do not have time for lukewarm educators; they need adults who are on fire and ready to make the biggest difference possible. When we become transparent about our profession, and show others our passion, it creates a safe harbor for families. They know without a doubt that their children are loved, valued, and have people invested in them. Imagine children and families who do not have this because of lukewarm educators. It is unfair and ultimately harmful. Encourage. Be REAL. Share the passion. Do all of these things daily, not just when you have time, or remember to do them. Make them a part of who you are. Weave them into your purpose–your WHY. Transparency of these traits will help others know you, and trust you. Do these things with joy and intentionality, because you cannot fake authenticity or passion. Breaking a mold is not easy, but it will be worth it. What mold are you working in? Does it need to be recreated in order to make a larger impact? If you have recreated a new perception of the school leader, are you reflecting on it’s impact and revising if necessary? Be the BEST you can be for kids each and every day. Kids deserve that, and so do you. Squash the stereotypes through actions and conversations. Prove the importance of the lead learner role. We have so much power. Let’s use every ounce to be heroes for the profession, and to recreate the stereotype. Join me…we are better together. 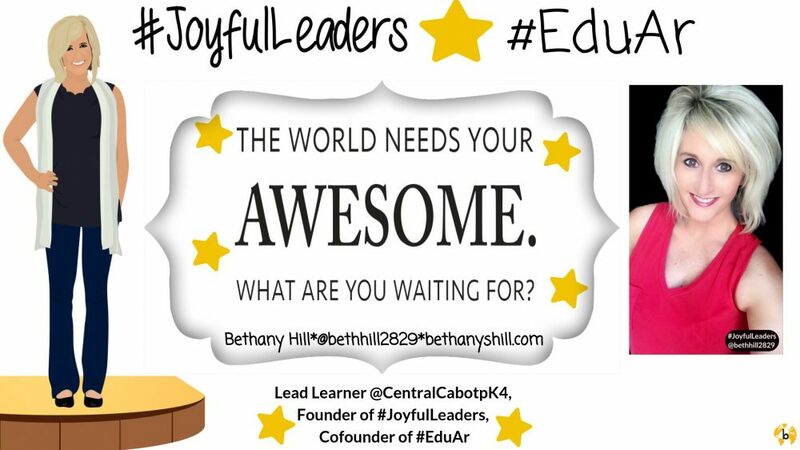 This entry was posted in Edcucation, Leadership, Relationships, School Administration, school culture, Vision/Goals and tagged Education, equity, goals/vision, Leadership, school leaders, women leaders. Bookmark the permalink.